Used to Dilate Esophageal Strictures over previously placed wire guide. Available Sizes - 5mm to 20mm Outer Diameter. Other sizes can be produced on specific request. Soft, Flexible and Radioopaque Tip & Radioopaque Junction. Dilator Size-Diameter-5 mm. to 20 mm.Length 100 cm.,70 cm. Set of 6 Pcs. Even diameter./Odd diameter. Set of 12 Pcs. & 16 Pcs. 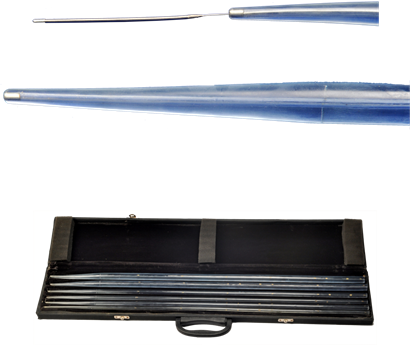 Set includes 1x Shaili Flexible spring tip Guide Wire 250 cm long. Carring case is available with order of set only.